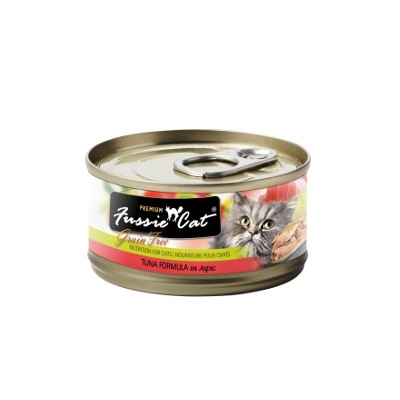 Fussie Cat® Tuna Canned Cat Food, 2.82 oz. 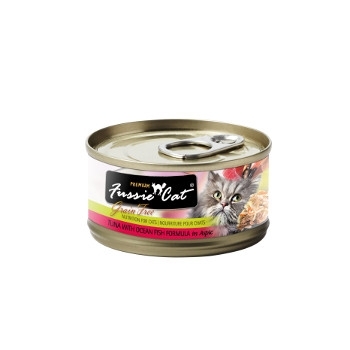 Fussie Cat® Tuna with Chicken Liver Canned Cat Food, 2.82 oz. 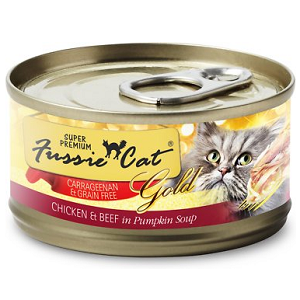 Fussie Cat Chicken & Beef Canned Cat Food, 2.82 oz. 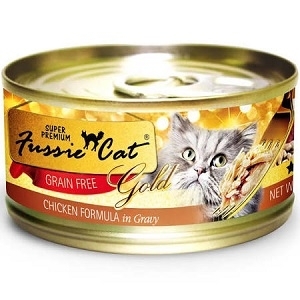 Fussie Cat Chicken with Gravy Canned Cat Food, 2.82 oz. 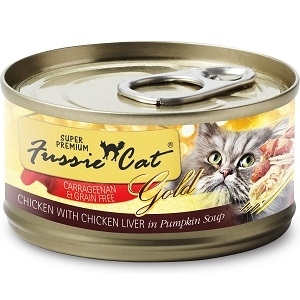 Fussie Cat Chicken with Chicken Liver Canned Cat Food, 2.82 oz. 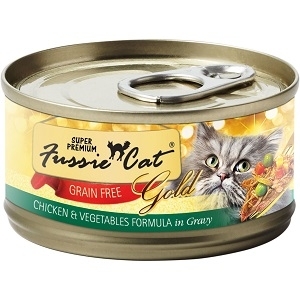 Fussie Cat Chicken with Vegetables Canned Cat Food, 2.82 oz. 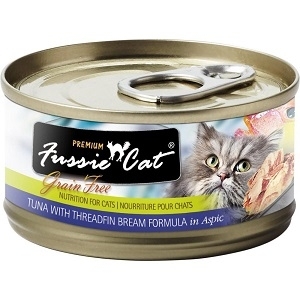 Fussie Cat Tuna with Threadfin Bream Canned Cat Food, 2.82 oz. 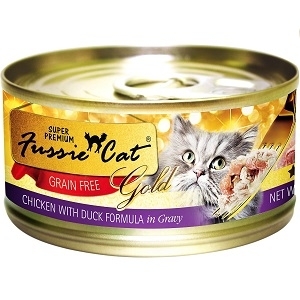 Fussie Cat Chicken with Duck Canned Cat Food, 2.82 oz. Fussie Cat Chicken with Egg Canned Cat Food, 2.82 oz. 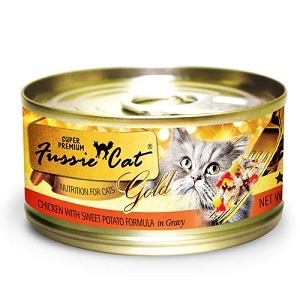 Fussie Cat Chicken with Sweet Potato Canned Cat Food, 2.82 oz. Loaded with complete, high-quality protein and essential amino acids thanks to a hearty helping of Boneless Chicken, with the added flavor of fiber-rich Sweet Potatoes. Low in Sodium and high in Vitamin B6, Phosphorus, Niacin and Selenium, our recipe provides both Omega-3 and Omega-6 Fatty Acids, and a complete spectrum of vitamins and minerals. Fussie Cat Tuna with Ocean Fish Canned Cat Food, 2.82 oz. Tuna and Ocean Fish provide complete, high-quality protein and essential amino acids in this flavorful recipe. Low in Saturated Fat, high in Niacin, Vitamin B6, Vitamin B12 and Calcium, it’s an excellent source of Phosphorus, Selenium, and a complete spectrum of vitamins and minerals. 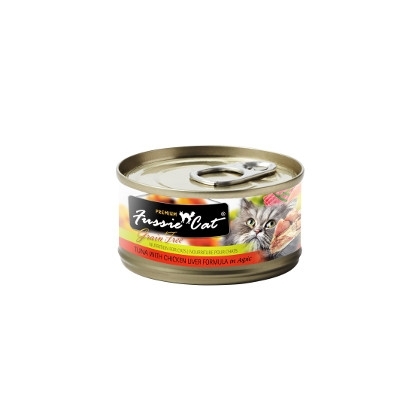 Fussie Cat® Tuna with Pawns Canned Cat Food, 2.82 oz. Tuna and Prawns provide complete, high-quality protein and essential amino acids in this flavorful recipe. Low in Saturated Fat, high in Niacin, Iron, Phosphorus and Zinc, and an excellent source of Vitamin B12, Selenium, and a complete spectrum of vitamins and minerals. 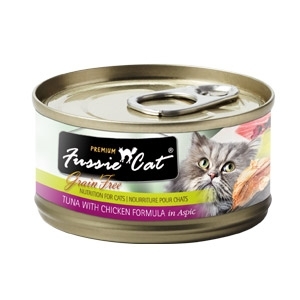 Fussie Cat® Tuna with Chicken Canned Cat Food, 2.82 oz. Tuna and Boneless Chicken provide complete, high-quality protein and essential amino acids in this nutritious recipe. High in Iron, Niacin, Vitamin B12, and Selenium, it’s an excellent source of Vitamin B6, Phosphorus, both Omega-3 and Omega-6 fatty acids, and a complete spectrum of vitamins and minerals. Fussie Cat® Tuna with Mussels Canned Cat Food, 2.82 oz. Fussie Cat® Tuna with Clams Canned Cat Food, 2.82 oz. Fussie Cat® Tuna with Salmon Canned Cat Food, 2.82 oz. Fussie Cat® Tuna with Anchovies Canned Cat Food, 2.82 oz. We’re proud of every meal that comes out of our kitchens. You’ll find our meat first, low carbohydrate philosophy in every recipe. The result is Physiologically Tuned™ nutrition for your pet that’s rich in complete animal proteins, and loaded with flavor. We use quality meats such as boneless chicken, duck, tuna, shrimp, and prawns, then further supplement our recipes with vital nutrients, including a complete spectrum of vitamins and minerals. Available in 2 lb. & 4 lb. bags. Our Market Fresh recipes are created with the freshest and finest ingredients. Like Salmon, which provides a complete, high-quality protein that’s an excellent source of Vitamin B12 and both Omega-3 and Omega-6 Fatty Acids. Not only is it the first ingredient in Market Fresh recipe, it’s also one of the most palatable foods available for felines. Available in 2 lb. & 4 lb. bags.